Check out this week’s vegetable line-up! Farmers Choice Winter Squash—We finished the season with a mish-mash of assorted winter squash remaining. We picked out the best of our stash you all received two squash of different varieties. Nearly everyone received a pumpkin, and quite a few of you received butternut, acorn, or buttercup squash. A very lucky few received an heirloom pumpkin like Musk d Provence, Tan Cheese, or Jarrahdale. We’ve been baking our winter squash cut in half and placed upside down on a baking sheet, then scooping out the flesh and freezing it for baking. We’ve made loads of amazing pumpkin breads and pumpkin muffins the past few weeks and can’t wait to bake up a few more batches with the couple of pumpkins left on the farm for your farmers to enjoy. Pak Choi—To us, Pak choi means it’s time to make yellow curry, made with onions and potatoes, simmered with coconut milk and sweet and savory South Asian spices. The Pak choi tossed in to wilt at the last minute is our favorite finishing touch to a good curry. Tatsoi—We teased that we should throw in a pair of chopsticks to the box this week as a not-so-subtle hint of what we recommend you do with this week’s share! Tatsoi is a much overlooked Chinese cabbage that has a similar flavor to spinach. We made the BEST soup this week with loads of ginger and garlic, assorted veggies, rice noodles, even a poached egg. The key to a good Japanese soup is a really rich and flavorful broth. Start there, and you can’t go wrong. The separated Tatsoi should be tossed in near the end to wilt a bit. Radishes—Our multi-colored Easter egg variety. These are crisp and mild from the cool weather. To preserve their crispness, chop off the tops and store sealed tightly in a bag in the fridge. Sweet potatoes—If you haven’t tried them sprinkled with Jamaican Jerk seasoning, then roasted in the oven, that’s a fantastic way to prepare them. Arugula—My new favorite way to eat arugula: massaged arugula. A little shake of sea salt + a drizzle of E.V. olive oil, and give those leaves a little rub. Seriously it’s heavenly. Wait to wash veggies until you’re ready to use them. Greens will prefer to be in a plastic bag in the crisper drawer. The radish roots should be severed from their tops and stored air-tight to stay crisp. The sweet potatoes and winter squash like to hang out at room temperature until you’re ready to eat them. They don’t have much longer to store, so use them up soon. 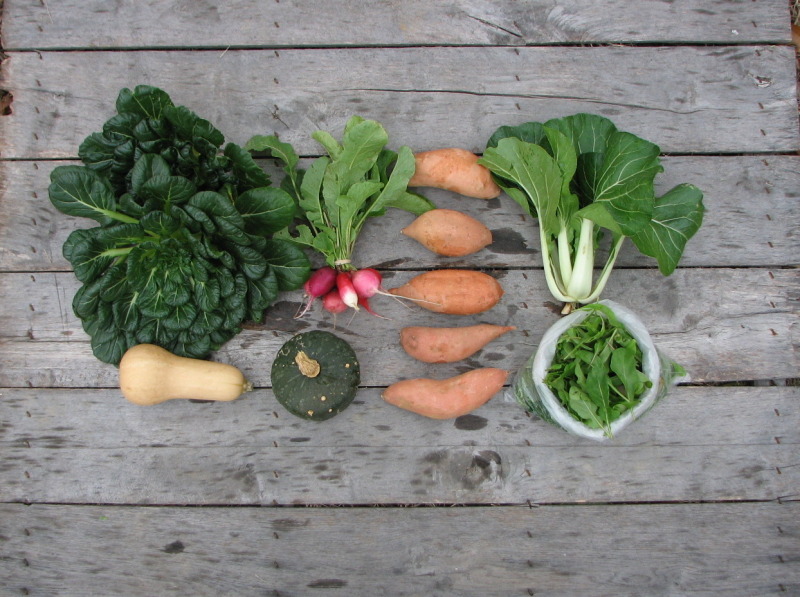 Thank you, thank you, THANK YOU for being a part of our Fall CSA season. We’ve loved growing for you. The spring season registration will open soon and it always fills up quickly, so watch your emails so you can jump on in! Have a lovely winter holiday and we’ll be planting for you again soon. Large Share (top row): Easter egg radishes, Musk d’ Provence pumpkin (a large assortment of pumpkins were given out. This is just one example) arugula, acorn squash, pak choi (bottom left), two Tatsoi (center and right), and sweet potatoes. 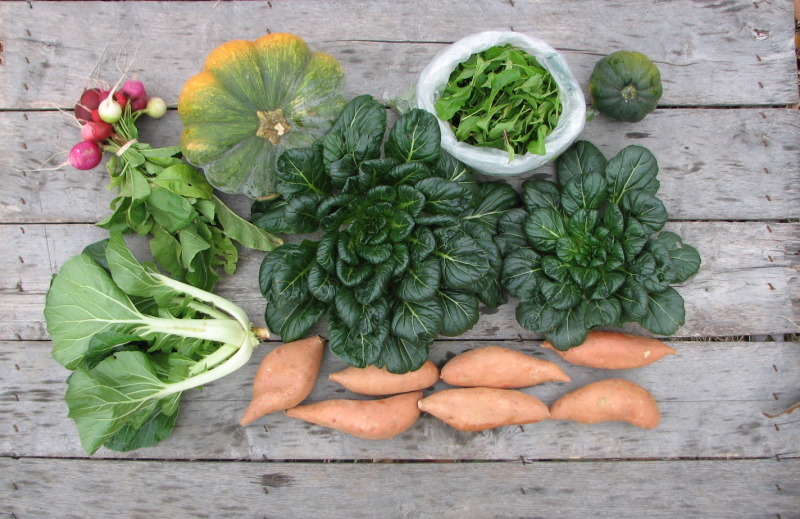 Small share (top row): two Tatsoi, Easter egg radishes, sweet potatoes, pak choi, (from bottom left): butternut squash, buttercup squash (some received pumpkins), and arugula. With this last share I found a acorn/buttercup squash recipe that I really like. It has a honey apple cider vinegar glaze along with pomegranate nuts. Thank you for all the wonderful goodies! !